MiteGuard is NZ’s leading brand of allergen barrier bedding covers, made in New Zealand using proven, effective allergen barrier fabrics and construction methods. These Mattress Covers encase your whole mattress to form a natural, micro-weave barrier between the sleeper, and the dust mites. Are you ready for this bit? It's both the dust mite bodies and their faecal matter that cause asthma, rhinitis (inflamed, runny nose) and eczema in sensitized people, which can significantly disrupt sleep for the whole family. Click on the questions below to see more about Dust Mite, allergen barrier covers and how to get the best results. House dust mites are tiny creatures – about 1/3 of a millimetre in length. They do most of us no harm but some people are sensitised to the allergenic proteins that dust mites produce, so they get allergic conditions such as asthma, rhinitis or eczema. Dust mites love humidity of 50%+ year-round and temperatures above freezing – making most of New Zealand (and Auckland in particular) a perfect environment to thrive in. Dust mites thrive on the tiny flakes of dead skin we shed every days (up to 1gram per day) – especially in bed where it’s warm, humid and the food source is plentiful for them. A brand-new, dust mite-free bed or carpet can be colonised in a matter of weeks. Here is the nasty bit. It’s the bodies of the mites and in particular their faecal droppings, that contain the potent allergenic proteins which trigger allergic reactions - asthma, rhinitis (inflamed, runny nose) and eczema. Reducing contact with these allergens can dramatically improve allergy symptoms. 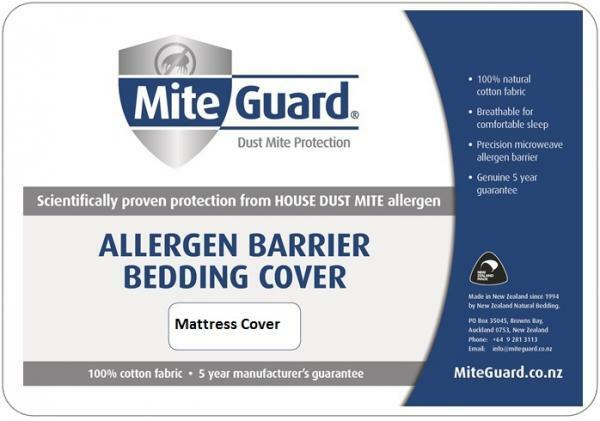 MiteGuard is NZ’s leading brand of allergen barrier bedding covers. They made in New Zealand by NZ Natural Bedding using proven effective allergen barrier fabrics and construction methods. Our covers are not just elasticated sheets like some inferior products; they are complete encasements (an essential design element) that create a truly effective allergen-barrier cover between the dust mites and the sleeper. MiteGuard fabrics have been independently tested and proven to block the transference of house dust mite allergen (Der p1) to below detectable levels. This is in contrast to products available through retail stores which have no independent test data, meaning there is no proof that they work at all! MiteGuard covers are easy to use and immediately and significantly reduce your exposure to dust mite allergen. The covers are fitted directly to your mattress, duvet or pillow, and then put your usual sheets or covers over the top of the MiteGuard covers. Regular (weekly) washing of the outer sheets and covers in hot water (hotter than 55oC) will maintain a low allergen environment in the bed. MiteGuard covers are designed to be robust, and easily cleaned. You can lightly vacuum or wipe-down with a damp cloth on a weekly basis. Then once every 8-12 weeks, you can machine-wash your cover just like any other normal linen. BUT to effectively control dust mite allergen, it is essential to machine-wash using hot water over 55ºC. You may need to by-pass / adjust your tempering valve to get your hot water system to the temperature needed (60ºC is enough to be effective). Contact a plumber to help you. I would recommend using an environmentally friendly detergent, but found that MiteGuard can handle whatever I use with my other bedding. Being natural cotton, you should expect to see some shrinkage in the wash, but MiteGuard allow for extra fabric length in their cutting and making of the covers. You can hang-dry your MiteGuard products - preferably in direct sunlight to further reduce allergen in the fabric. You can even tumble dry MiteGuard products (the microweave cotton fabric is designed to be treated normally at home). Research shows that lowering exposure to dust mite allergen can help allergy sufferers thereby reducing the frequency & severity of their symptoms, and reducing their need for medication. To reduce allergic reactions, it is essential to understand the most important allergen reservoirs around the house, and learn how to effectively deal with them. Here are some tips from the team at MiteGuard. In most homes, the mattress is THE major reservoir of dust mite allergen. 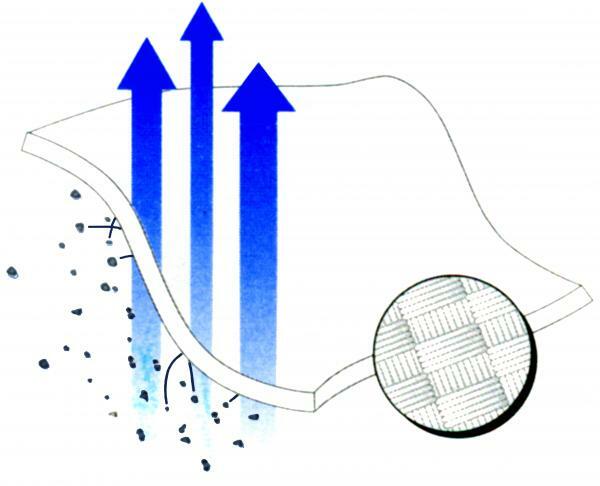 The depth and complex construction of the mattress means that no amount of vacuuming or treatment with mite-killing sprays or powders (acaricides) will render it completely free from dust mite allergen. Complete encasement with a specialised allergen-barrier cover such as MiteGuard is the only effective means of protection. 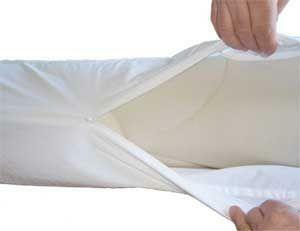 Your MiteGuard bedding cover should be lightly vacuumed or wiped-down with a damp cloth, on a weekly basis. Then once every 8-12 weeks, do a hot-water machine-wash (at least 55°C to be effective) which will kill any dust mites and prevent a build-up of allergen on the cover. Pillows are a major source of dust mite allergen – and our noses are pressed up against them all night long! Most of the dust collected in pillows consists of flakes of dead skin and dust mite droppings! A MiteGuard pillow cover and regular weekly hot water washing of the outer pillow case will protect you from this major source of allergen, and let you sleep much more peacefully. All sheets should be hot water washed weekly. Blankets should be hot water washed monthly (at least) or if woollen, dry cleaned. A duvet fitted with a MiteGuard cover and weekly hot water washing of the outer duvet cover is the best way of eliminating dust mite allergens from the outer bed covers. Polished flooring is really the best solution. Loose rugs which can be regularly cleaned will help create a more comfortable atmosphere if you prefer. Soft toys should be washable. If a regular schedule for washing the soft toys in hot water is adhered to from when the toys are new, allergen build up should be reduced to a minimum. Alternatively, regularly placing soft toys in the freezer overnight is an effective way of killing any dust mites which may have taken up residence. Older soft toys which have been "loved" for a long time may contain large amounts of allergen. Regular cleaning, putting things away, reducing clutter, remove hiding places for dust! When dusting, use a damp duster to avoid "stirring up the dust". There is no need to vacuum more than once or twice a week but it is very important that your vacuum cleaner is properly maintained. Clean the filters and replace the dust bag frequently - don't wait until your vacuum cleaner stops sucking because the dust bag is overflowing! If dust created during vacuuming causes obvious problems to the allergy sufferer, buy a new vacuum cleaner with a high-efficiency 'HEPA' exhaust filter. When was the last time you had your curtains cleaned?! Curtains can become very dusty over the years. Have them cleaned once or twice a year and take the opportunity on a sunny day to air them on the washing line. A note about hot water. Current building regulations require the fitting of 'tempering valves' to the hot water system. These effectively reduce the temperature of water in the washing machine to less than 55°C resulting in "hot" water washes that are not hot enough to kill dust mites. A plumber may be able to by-pass the valve, allowing hotter water to the laundry. Alternatively, consider buying a 'front-loader' washing machine which heats the water to 60°C.